Carlton Haelig submitted this photo and caption. 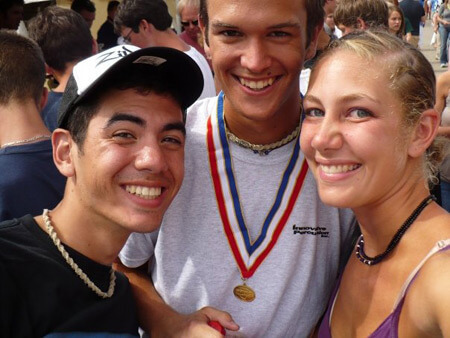 This photo was taken after 2008 Open Class World Championship Finals in Bloomington, Ind. It is of me and two of my friends from high school. From the left: Chris (Raiders), Me (Raiders), and Stacy (Jersey Surf). While we traveled across the country with different groups we still managed to get together and share some memories after it was all said and done.